A brass band, a children’s choir and a woodwind ensemble helped YMCA Norfolk celebrate the true meaning of Christmas at its annual Carol Service at the Norwich Salvation Army Citadel in Norwich yesterday. 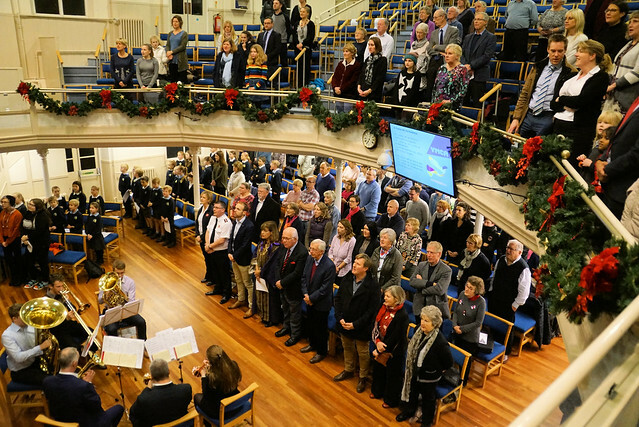 Residents, staff and supporters were among a congregation of around 140 who sang Christmas carols and listened to Bible readings from young people and the Sheriff of Norwich Ros Brown. YMCA Norfolk chaplain, Joseph Zimmerman, from Soul Church, said to his audience: “I have heard some people are asking ‘what is the real meaning of Christmas?’. We sometimes get so caught up in the giving and receiving of Christmas gifts that we forget that the ultimate gift we received when Jesus came to earth is peace. Singing from the Alpington and Bergh Apton Church of England Primary School Choir and music from the Huff ‘n’ Puff woodwind ensemble, based in Alpington, along with a brass band made up of Salvation Army members and others all contributed to the service. Click here or on picture below to see a full gallery of the service.